Bulldog Movers is here to help Atlanta residents with all different types of moves. We can relocate offices and provide international location services, as well as residential moves. 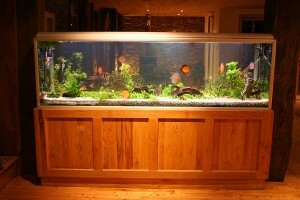 And if you have a fish tank that needs to be moved, Bulldog is the perfect choice for you. We will disassemble your tank and reassemble it for you when you reach your new destination. Unfortunately, our movers in Atlanta cannot pack your fish in our bright red moving trucks to transport them. We would, however, like to offer some advice for transporting your fish from your old home or apartment to your new one. When we arrive at your new home or apartment, we understand that you’ll be anxious for your fish to get back in the tank. That is why our Atlanta movers’ first priority will be to assemble your fish tank and place it exactly where you want it to be. It is service like this that has helped us maintain an A+ rating with the Better Business Bureau, win the Consumers’ Choice Award for nine consecutive years, and put smiles on countless faces. For additional moving tips and information about our movers in Atlanta, please give us a call or e-mail Bulldog today.